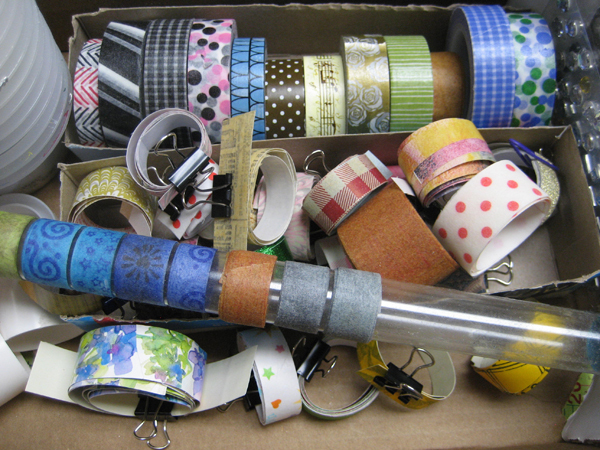 I have a few rolls of washi tape that I have purchased over the years. The ones purchased together coordinate but the groups do not coordinate very well so I am often left wanting to use the tapes but not finding what I need in the collection I have. SO..... I decided more washi tape would be required before I could liquidate the supply I have. Make any sense?? There is some logic to it but as you can see from the box that by the end of my Washi Tape making session I have pretty much tripled my selection!! And so it is! Those with clips have a carrier and those on the tube were made with the medical tape. I did a little bit of research on line looking for Washi Tape tutorials and found quite a few using several different techniques!! I really like the translucent look of the ones made with tissue paper so I decided to give it a go! 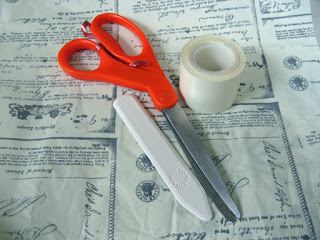 I collected tissue paper, double sided tape, a pair of scissors and a scoring tool (AKA a bone folder). For any tissue paper that was not smooth I gave it a bit of a press with my iron before getting started. Once flat, I ran a length of double sided tape over the back side of the tissue paper and then carefully trimmed both sides with the scissors. Next I burnished the whole length to ensure its adherence and smoothness. 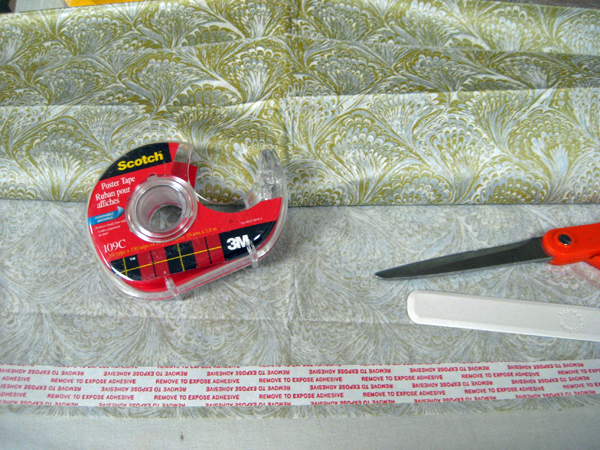 It is best to work on a hard surface which reduces the amount of wrinkles introduced into the final washi tape. I used clear double sided tape with a substrate as well as a carrier. Having a carrier works the best when it comes to storing your newly created washi tape because you can just roll it up and it does not stick anywhere you don't want it too. This washi tape is very sticky and therefore cannot be rolled onto itself like the commercial kind. It does not tear easily because of the substrate but it has the translucent quality that the commercial ones have. For my second attempt I used a more opaque tissue which came wrapped around something and a wider different opaque double sided tape. These two worked quite well together but the result is opaque and does not tear because of the plastic substrate as well. It can easily be coloured with ink pads and stamped on to add some texture and designs which means it can be customized for any project. Using wider tape allows you to cut it down in width and get twice as much washi tape for your effort. On my next attempt I used double sided tape from a local store which is very thin and has no substrate - just glue on a carrier! This one works the best to make nice translucent tape that tears easily!! You do have to be careful to use the clearest glue you can get. 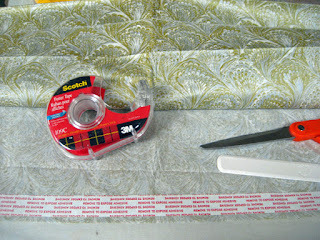 Yellow glue will show through white tissue paper and affect the look of your washi tape. Of course, if used on warm coloured tissue paper it matters much less. Very close to the real thing though you cannot roll it onto itself because it is too sticky!! I really liked this tape and it was fun to play in my supply of tissue papers!! In the tutorials they suggested that the single coloured layer of paper napkins can be used in the same way. Will try that next time!! On my last attempt I used medical tape!! I laid out several strips on a the smooth back of a plastic place mat before applying colour with permanent ink pads. I used tiny detailed stamps and coordinating permanent ink colours to add some texture and designs to these lengths of washi tape. This tape does take colour reasonably well but is generally still quite translucent and when dry is the most like real washi tape as it can be rolled upon itself as it is not too sticky and tears very easily. It is more difficult to get really bright and contrasting colours on this tape. I have used watered down acrylics in the past and it works as well as the ink did. You can check out my Faux Washi Tape posting here!! I will consider a coat of gesso on the tape when I try this next time. It should give me a bit more opacity but also provide a better surface to which I can add paint or ink and get brighter colours. This should allow a broader spectrum of ways to finish off the tape with colour, markers, stamping, etc which should provide a wide range of interesting washi tape that would more like the commercial ones. So I am very happy with my experiments with making my own washi tape!! I most like the thin tearable double sided tape on the tissue paper and except for not being able to roll it onto itself it makes great washi tape. It works for me because of the large variety of tissue papers I have. The medical tape works really well too and because it requires ink/paint and stamps it a good option for someone who had an abundance of those instead of a tissue paper supply. Be sure to create some coordinating washi tapes so you can combine them in your creative projects!!!! Leave me a comment and include a link to your Washi Tape fun!! !